I was a cop…. I was in the military… I can be a PI right? Negative headquarters; that is just not always the case. I am Richard A. Brooks, a private investigator. I am also a former active duty military and civilian law enforcement officer. After serving as an active duty Air Force Security Policeman, I was an Army National Guard Combat MP, a county deputy, a city cop and a state narcotics agent. I have been a PI for approximately fifteen years since leaving law enforcement. I have been licensed in nine states during the course of my career as a private investigator. Currently I hold PI agency licenses in three states in the Southeast. I am like a lot of PI’s, in that I am former military and civilian law enforcement. I am unlike many of those PI’s in that I did not retire from either. I became a PI at the age of 32. Many of my colleagues from law enforcement and the military retired and then became a PI. There’s certainly nothing wrong with that. Those investigators have unique skills that can certainly benefit them in the private investigations field. When I left law enforcement, I was working as a Hospital P.D. Investigator. The job was boring and unfulfilling. I was contacted by an investigations firm in Florida conducting nursing home investigations for attorneys. The job sounded equally as boring to me. The salary, however, was significantly more than I was making, and so I took the job. Nursing home investigations entailed locating and interviewing witnesses. As a former cop, that was right up my alley! I enjoyed the work and performed well at it. Once tort reform hit in the states I was working, however, I had to find another line of work. I then began my career in insurance fraud investigations. I went to work for one of the big investigative firms in Florida. This is one of the three or four large nationwide investigative companies that now run the field. My job was to be a surveillance investigator. After all, I was a cop and a narc. As a narc, not only did I work undercover, I also performed surveillance with other narcotics agents. It was the same thing right? Negative. Although these large insurance fraud companies are really “mills” in my opinion, chewing up new investigators and spitting them out, they actually trained me well. This particular company did not really care about my “law enforcement” background. They knew better. They made me go through their training program and ride with one of their investigators. It was a bit like the FTO program all over again. My trainer was a retired Navy Seal. He was nothing like I anticipated. Although not afraid of anything, he was very covert. He taught me the art of surveillance and locating claimants. It was nothing like chasing after a drug deal with five or six narcs and no cameras like we did back in the day. When it came to claims investigations, or SIU (Special Investigations Unit) cases, my law enforcement training suited me well. Working auto thefts, auto burglaries, house fires, conducting area canvasses and obtaining recorded statements, etc…, were no problem. I did, however, have to learn to write a report for these companies, which was nothing like the police reports to which I was accustomed. Fast forward fifteen years later and I’ve done it all. I now have my own company and I have worked insurance fraud – surveillance and claims / SIU investigations, plaintiff’s cases, criminal defense, undercover investigations, process service. You name it and I have done it. I have also hired and fired countless police officers, many of whom were my friends and former colleagues, over the years. When my friends needed a job, I gave them one. Although I continue to use them, and probably will never stop, I have learned a great deal about law enforcement and private investigations. I like to think that many of my friends and former colleagues have also learned a lot. When I left the military and became a civilian police officer, I had to change the way I dealt with people. As a police officer, you cannot treat the general public the same way you would at a military installation. The public has fewer restrictions as those on a military base. When I went from being a uniformed cop to working undercover, it was a shock. Cops like being cops, for the most part. They enjoy people knowing they are who they are. As a narc, you do not want anyone knowing who or what you are. There was an adjustment there. When I left law enforcement and became a PI, there was another change. On surveillance cases, I had to be covert and hidden. While working criminal defense, I could be overt. On SIU matters, I could be the overt “insurance investigator” and let everybody know what I was doing. Sometimes however, while working insurance fraud or as a process server, I had to switch back to being covert. I had to learn to turn it off and on. Cops tend to make excellent “top side” overt investigators. They tend to do well at criminal defense and claims investigations. Some do great at process service. Sending a cop into a jail to interview a suspect in an insurance fraud investigation is usually no problem at all. On occasion, I have to give them the “You get more flies with honey” speech, but for the most part, former cops do well at interviews. Surveillance, however, is another issue. Most cops hate it. I am not particularly fond of it either but I’ve been doing it for 15 years. Now I teach it. I found that in the Southeast where I work, there are simply not enough SIU cases or surveillance investigations to stay busy full time. As I had no retirement and needed to work full time, I had to do well at both. Being versatile will benefit you and assure that you have plenty of work in this industry. The vast majority of police officers are not trained to utilize a video camera. You have to practice with it and make your video fit for a Hollywood production. These companies expect crystal-clear, steady video fit for a large screen in front of a jury. This is usually another problem for my law enforcement friends. If you get past that, the video then has to be downloaded from the camera to a computer, and then e-mailed to the client. This is usually required within 24 hours. These types of requirements and deadlines are another challenge. I have met many former law enforcement PI’s who say, “I don’t do surveillance.” They are just fearful of the work and they do not want to be covert. They do not want to be hidden. Many do not want to deal with the camera and obtain the footage needed for court. I get it, but why limit yourself? My biggest challenge in managing my former colleagues, however, has been the reports. I can remember seeing arrest reports for public drunk which read, “Saw drunk, arrested same.” That may get by in some departments but not in the private sector. Large PI firms, attorneys, insurance companies, and many in the general public want a detailed report, complete with photos and video if they were obtained. There has to be a detailed invoice. You have to justify your time and efforts. Some clients force us to utilize their own report templates. If the report is not written to the client’s specifications and turned in within the time frame set by the client, they will not pay. It’s very different from working at the police department when you can turn everything in the following Monday and you get paid the same amount at the same time. Updates to the client are just as bad. Some clients want updates before, during and after the case. No update means no pay. Domestic clients can be an entirely different matter, calling you constantly for updates. Many prior police officers are simply unwilling to tolerate that. Former law enforcement officers, especially those who have been in law enforcement for a substantial length of time, simply have difficulty with all that I have outlined. Many leave the PI field or they will discontinue accepting certain types of cases, thus limiting their earning potential. 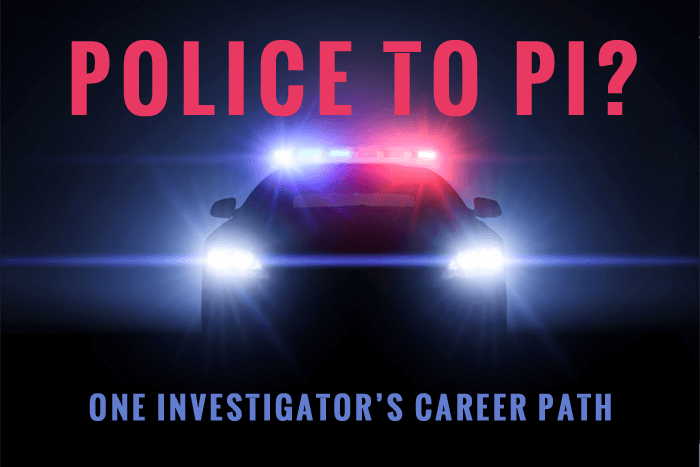 Prior police officers and military personnel have a valuable set of skills that can be useful in their work as a private investigator. However, they should be aware that working as a “private” investigator, will be much different than being a police or military investigator. Do your research before jumping into PI work. Don’t take for granted that “it’s all the same.” Determine what cases would interest you. Speak to other PI’s and network. Learn the pitfalls associated with some types of investigations. Some people cannot be cops and some cannot be PI’s. Be willing to learn new things from new people. You can do it! private investigations can be a rewarding profession or it can be a nightmare. Be professional, help others and do what you love! Richard A. Brooks is the owner and lead Investigator of Richard Brooks Investigations, LLC. RBI is based in the Jackson, Mississippi metro area and serves portions of the Southeastern United States. Richard is the Immediate Past President of the Mississippi Professional Investigators Association and the Mississippi Chapter Director of the Association of Christian Investigators. Richard is also a member of other international, national and state PI associations, most notably the Council of (PI) Association Leaders, the National Association of Legal Investigators and the International Intelligence Network. Richard is a former active duty military and civilian law enforcement officer. He has been designated and testified as an expert in general police procedures.